We’d go out there and we’d barbecue the steaks, giant baked potatoes with butter and sour cream (with my mother looking the other way) and salads. So we’d sit there with TV trays and watch Perry Mason. So sometimes I just get a nostalgic kick. 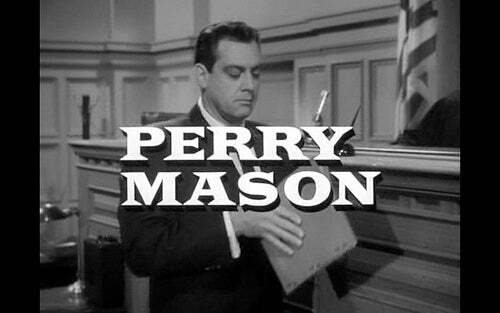 I’ve got a bunch of Perry Masons on DVD. But very few of them, only the most recent releases (season six, seven, eight) have closed-captioning. So a friend of mine has gone out, found the early seasons with the closed-captioning files, and has unified them. He was asked if he could testify whether or not two particular people were at a party he had thrown. And in his arrogant, aristocratic way he said, “Mr. Mason, my parties are so entertaining that no one’s aware of anyone else who’s there, much less me,” and it’s sort of that way with the low-information voter. They don’t have enough information to know that they’re low-information, so they think I’m talking about somebody else. Ask them; they will tell you. So Snerdley’s all worried about this, because I had being low profile as a New Year’s resolution, to be far less threatening. I don’t think I’m threatening at all, but to some people I am. So I’m trying to dial that back. So Snerdley said, “You might be offending them.” I said, “No, no, no. They don’t think they’re in that group,” just like the 47% that Romney was talking about. Nobody in that group really thinks they are. RUSH: Christie, Strongsville, Ohio. I’m glad you called. Welcome to the EIB Network. Hello. CALLER: Hello, sir. How are you? RUSH: Just fine. Thank you very much. I’m just fine. Thank you very much. How are you? RUSH: Thank you for calling. CALLER: I’m calling because I’m a little offended. CALLER: Well, at your words that you use. I am — well, I used to be — an uninformed voter, and I get offended when you say that we don’t care; that we are just too stupid to know what’s going on. CALLER: ‘Cause we’re not. We do care. RUSH: No, you are inferring things that I have not said. I haven’t even implied that. CALLER: But you said we don’t care. RUSH: No. I’ve said low-information, means you don’t know, means you’re not informed. Some low-information don’t care, to the extent that they care around election time every year, but other than that, it’s TMZ and the E! Entertainment channel. CALLER: Right. And that’s exactly what they watch, because the local news does not tell us anything. RUSH: That’s exactly my point. You are confirming what I’m saying. You know, uninformed is not low informed. Uninformed is not they don’t care to be informed. RUSH: The low-informed voter simply chooses to be informed about other things, like Claire Danes and what she did with Clinton after the Golden Globes. Or Kim Kardashian’s baby with Kanye. I mean, they care more about that than they do the debt limit. CALLER: I have found five more people that listen to you because they heard you say something about Kim Kardashian. RUSH: See? I think it’s working. CALLER: You’re actually working there. CALLER: You do the right thing every now and then when you give that little tidbit. RUSH: I’m happy to hear you say that. RUSH: I really am. It’s working. How many people did you say, five? CALLER: Five people. I have been trying to tell everybody I know since I have become more informed that they need to start paying attention, because I come from a group of people in my world, we have children, we have basketball games and football games and cheerleading practices and music lessons and PTA. Then we have to clean up when we get home. Then we have to make dinner and then clean up from dinner. Then it’s bath time and it’s bedtime. We don’t have time to pay attention to CNN, NBC, MSNBC, all that garbage. We watch the local news, mostly at ten o’clock and then we go to sleep because we can’t stay up any longer. When we are in our cars we are either talking to our children or we are listening to the music stations, which tell you way less than any of the other things do. The local news is where we get our information from. The local news does not tell you anything at all. When I heard about the Benghazi thing, you know, that guy that did that stuff over in the Middle East, I rushed home and waited and made sure that I made the ten o’clock news to watch it, even though I had 50 other things that I had to do. I made sure that I could watch it. Twenty-five minutes after it started, it came on, they spent a minute on it, and I know it was a minute and 12 seconds because I rewound my DVR. A minute-twelve on the Benghazi thing, and the guy turned after he said, “An ambassador was killed and three other Americans over in…” you know, blah, blah, blah, and he turns to the lady beside him and he says, “Those people are always fighting over there. And in other news, a box of puppies was found on the interstate.” I was like, holy crap. You seriously did not spend more than a minute! They spent five minutes after that on puppies in a box. CALLER: And that’s just it. I started calling people and texting people and messaging people on Facebook, 785 people in my list, and I was able to find 12 people — literally 12 people — that knew Benghazi was not a guy. Seriously, they think “Ben Ghazi” is some guy. And “Al Jazeera,” he’s the guy that owns that radio station. RUSH: What they think is that “Ben Ghazi” is a guy who made a video that caused a riot, and he’s in jail now accused. CALLER: They didn’t even know about the video. All they knew was that “Ben Ghazi” was some guy over in the Middle East that did something with the ambassador. RUSH: Well, what was it that allowed you to break through all this and graduate from low-information status? CALLER: Actually, the Benghazi thing was the really big, big thing. But I’ve been kind of listening from time to time over the past few years because I came in to work one day, and it was before — not this last election, the first other election. I happened to see this nice-looking black man on TV, on the regular news, talking about how parents need to be held accountable, and that was really all I caught. And I went to into work the next day, and I said, “So there’s this senator guy that’s gonna be running for president, and his name is Obama or something or other, and I think he might be awesome.” And my boss hit the roof. Forty-five minutes later, after this tirade of Republicans and Democrats and political this and political that, he told me, he said, “You need to start paying attention, because that guy is not the guy you think he is.” And I kind of started paying a little bit of attention here and there, but then I had a baby. I got busy. I was doing some stuff. I haven’t really been paying attention. A little bit here, a little bit there, then the Benghazi thing, I happened to be listening all day that day, caught the news in the morning, I listen to several other political talk show people now, and I was like, holy crap, I gotta pay attention. And they spent a minute and 12 seconds on it on the local news. The last time any ambassador was killed was like 30 years ago. I was three or four. RUSH: — 30 minutes of the local news then you gotta go to bed. Your day is shot. We understand. That’s who we’re trying to reach.